I’m sure everyone love to get awesome products without having to spend a lot of money. Or maybe you just want to gloat to your friend that you have the same new shiny toy that they have but only spent a fraction of the cost. Well, that’s where Daily Steals comes in, offering you deals on many products and changing up the deals daily — it’s kinda in their name. 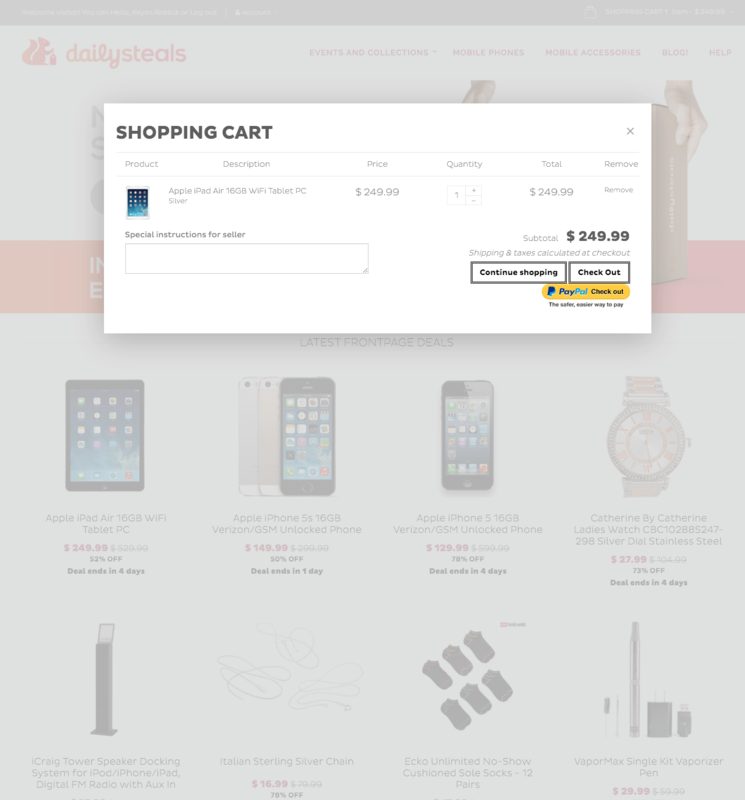 Daily Steals has just updated their website layout that give a more pleasing look to their low prices on products. At the top of each page you’ll see an position-following top bar that hosts the new Squirrelly, DS logo, an “Events and Collection” dropdown, mobile phones and mobile applications shortcuts, blog shortcut, and support shortcut. The cart shortcut and place to sign in have been moved to a small gray bar right above that. The sign in expands to ‘Hello, Welcome [name]’, ‘My Account’ and ‘log out’ shortcuts after you sign in. Underneath on the main page, you’ll see a rotating slider with the latest announcing within. Below that, you’ll see the title of the collection (unless on the main page) and then a minimal grid of the deals for that day. The grid very visually pleasing, with a medium-sized main image of the product on the top and the item title, price, time remaining, and buy buttons beneath it — which takes you to choosing your configuration to buy the item. It’s very concise and clear to know what you are getting and how long you have to get it. You can click anywhere on the specific item’s ‘tile’ to get brought to that product’s information page, where you’ll see more details about what you’re getting and more images as well. At the bottom of any page you’ll see related products and in the footer some quick links to other places on the site and social links. Daily Steals has ditched their orange theme and gone with a red-orange gradient, but it is still minimal and eye pleasing. Another thing to note is that the ‘Cart’ is no longer its own page, but rather a popup that can be view on top of any page which will allow you to still see a product your looking at while checking on your total price tag. Head on over to Daily Steals now to check out the new site design and catch some great deals — there are a bunch of Apple ones on the front page featuring various iPhones and the iPad Air! Also, make sure you create an account for easier buying and tracking of your products. Next article Wireless Charging: Is It Worth The Hype?